If you’re searching for a luxurious home away from home in Barcelona, look no further. La Casa de les Lletres has everything you’re wishing for and more. Second-floor loft apartment, ideal for families. The perfect way to wind down after days spent exploring Barcelona. 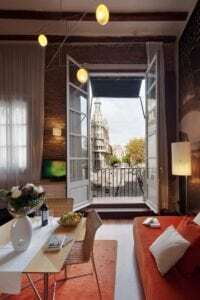 Set in the beating heart of Barcelona’s treasured Gothic Quarter, La Casa de les Lletres is located on the lovely Plaça d’Antonio López and offers sweeping views of the old Correos y Telégrafos (post office) building, the Cap de Barcelona sculpture, and even waterfront Port Vell. It can be booked for short- or long-term stays and is perfect for solo travelers, couples, and families alike. View of Plaza Antonio Lopez from La Casa de les Lletres. Spanish vibes, inside and out. 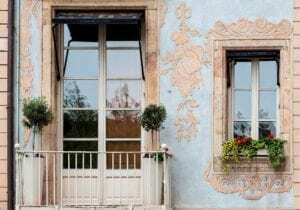 Soft blue and beige exterior of La Casa de les Lletres. 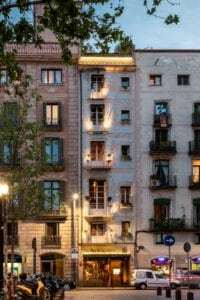 In addition to the perfectly central location, there are elaborately decorated literature-themed apartments, delightfully squeaky wood floors, and unbeatable golden-hour balcony views. There’s also a ground-floor café serving up breakfast, lunch, and dinner–opt for intimate al fresco dining under twinkling lights in the plaza, or if you’d prefer a night in, there’s always room service available. 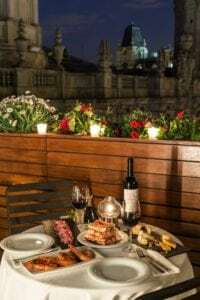 A romantic night under the Spanish stars, courtesy of the downstairs cafe. 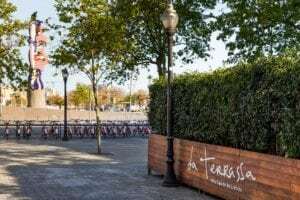 La Terrassa, the downstairs cafe’s al fresco option in the middle of Plaza Antonio Lopez. The building’s six apartments are stacked atop each other, so all of them offer the same stunning view from their balconies. Each floor is tastefully decorated to honor the literary achievements of a specific author with ties to Barcelona–for example, the fourth floor celebrates the work of George Orwell with giant “GO” initials adorning the walls, while the first floor features a famous quote by Jaime Gil de Biedma. Look around long enough and you’ll find a hidden bookcase containing volumes by each apartment’s chosen author! 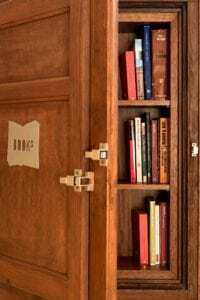 Hidden bookcase in a literature-themed apartment…the stuff of bookworms’ dreams. La Casa de les Lletres, as seen from Plaza Antonio Lopez at dusk. From the author’s pen to the walls of La Casa de les Lletres. As digital nomads, my husband and I were especially grateful for the fast and reliable WiFi, the complete kitchen (outfitted with oven, stovetop, kettle, microwave, toaster, refrigerator, and freezer), the washer/dryer, the plentiful scooter parking outside, and the grocery store just a few steps away. La Casa de les Lletres truly felt as comfortable and convenient as home. Additionally, the key fob-enabled entrance coupled with the automatically locking apartment doors helped us to feel safe and secure. Plus, the owner of the building and the waiters in the restaurant downstairs were always available to resolve any problems or answer any questions that arose. Enjoy breathtaking balcony views, even from inside. 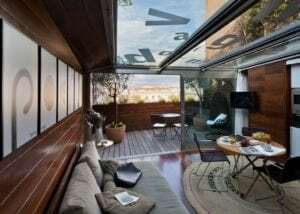 The top-floor penthouse features a lettered glass roof. Between the charming views, the attentive service, the lush amenities, and the impressive details, the hardest part of your stay at La Casa de les Lletres will be convincing yourself to leave the apartment. If you do manage to pull yourself away, rest assured that you’ll do so feeling both cultured and refreshed. Photos courtesy of La Casa de les Lletres. Hi Skye, I discovered your blog from Instagram and I’m super glad I did! Absolutely adore your blog – everything from your layout to your gorgeous photos – wow! This seems like such a lovely place to stay and the location sounds awesome too. Will definitely keep this in my bookmark for the day I visit Barcelona. Thanks for sharing! I stumbled across your blog this morning and for the first time ever was intrigued to look at a blog. I loved your story, and find you fascinating and because I too travelled to Palm Beach as a child in the winters and love to travel, your story resonated with me. I am also a certified travel agent and cruise coinsellor although Accountant by day. I’d love nothing more than yo travel as you are. I loved Barcelona and especially the Gothic section, next time we will stay here. We are plannings a trip to Portugal late summer, wondered if you have any recommendations. That’s so wonderful to hear, Cheryl! Thank you for reaching out and sharing a bit. How cool to be a travel agent! I bet that’s a lot of fun. It’s so nice meeting people with special things like Palm Beach and travel in common! I wish I had some Portugal recommendations for you, but I have not been there yet. It’s on my list! There are some great blogs out there about Portugal though, so I’m sure you’ll find some helpful tips if you do a little digging. Let me know if you need some extra help and I will ask around for you as well! Thanks again for getting in touch–it was very nice to hear from you!